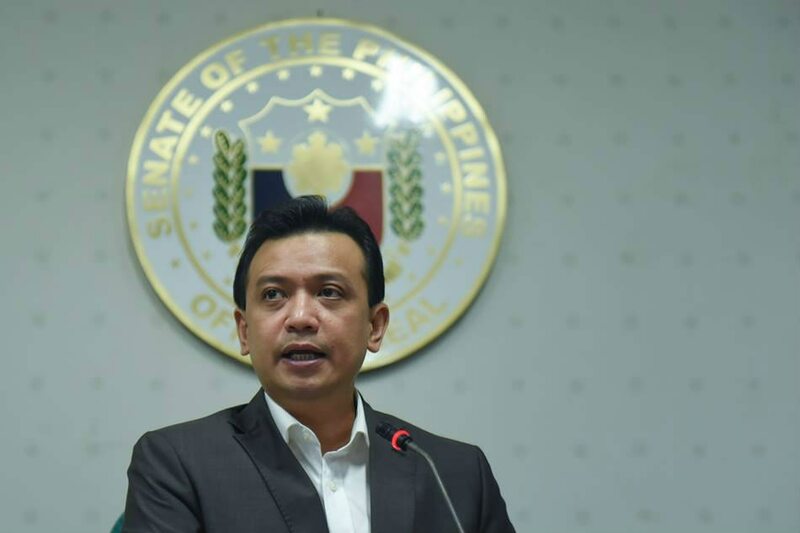 MANILA - (4TH UPDATE) President Rodrigo Duterte has invalidated the grant of amnesty to Senator Antonio Trillanes IV for failure to comply with its minimum requirements, Malacanang said Tuesday. The Department of Justice and the Armed Forces' court martial were instructed to "pursue all criminal and administrative cases" against Trillanes over military uprisings in 2003 and 2007, according to a copy of Duterte's proclamation, which was confirmed by Justice Secretary Menardo Guevarra. The military and the police were also ordered to "employ all lawful means to apprehend Trillanes" so that he could be detained. "I guess all of these would have to proceed and if taking him into custody is an automatic effect of that, then so be it," Guevarra told reporters. For his part, Trillanes denied allegations that he did not even file for amnesty. "Hindi ka bibigyan ng amnesty kung wala kang application. Maliwanag yun. Kaya nga ito it's a clear case of political persecution dahil wala silang mahanap na kaso sa akin so kailangang mag-imbento," the senator told reporters. Former presidential spokesperson Abigail Valte also tweeted a video of Trillanes filing his amnesty application. "Sen. Trillanes did not file an amnesty application? Too much bukbok rice, it seems. Here’s a video of the filing of that application," she said. Trillanes questioned the timing of the release of the Palace order when the Senate is set to investigate allegations that a security agency owned by the family of Solicitor General Jose Calida bagged 10 government contracts right after his appointment. He said the Palace order was published in a broadsheet at the same time that President Rodrigo Duterte is in Israel. Trillanes won a seat in the Senate in 2007, campaigning from detention. He was reelected in 2013. In 2016, he campaigned against then Davao City Mayor Duterte. Chief Presidential Legal Counsel Salvador Panelo in March said a review may be done on the amnesty given to Trillanes. The Duterte proclamation, signed on August 31, said that Trillanes was granted the amnesty even if he did not file an Official Amnesty Application Form according to a certification from the Office of the Deputy Chief of Staff for Personnel that "there is no available copy of his application for amnesty in the records." The former soldier also "never expressed his guilt for the crimes that were committed," it said. It quoted Trillanes as saying "they were not admitting guilt to the mutiny and coup d e'tat charges lodged against them both in the civil and military courts" and "I would like to qualify that we did not admit to the charge of coup d e'tat or anything na i-finile sa amin kasi we believe na hini iyon ang nararapat na i-charge sa amin." The proclamation noted that at the time of the amnesty, Trillanes was facing trial for non-bailable coup d'état before a Makati court and a separate trial before the military tribunal for mutiny or sedition, conduct unbecoming an officer and gentleman, and all disorders and neglects to the prejudice of good order and military discipline, and all conduct of a nature to bring discredit upon the military service defined and penalized under the Articles of War. DID HE REALLY FAIL TO FILE? Trillanes, then already a senator, formally applied for amnesty, which requires an admission of guilt, on January 5, 2011. In his application form, Trillanes signed a portion acknowledging his involvement in uprisings that entail "a violation of the 1987 Constitution, criminal laws, and the Articles of War" and recanting his statements in the past that are contrary "to this express admission of involvement/participation and guilt." His name was included in the list of applicants for the amnesty as proclaimed by Aquino released by the Department of National Defense on January 21, 2011.